Venice's popular seaside resort is a convenient place to stay if you're flying in or out of Venice, or if you want to enjoy the beach for a week (with or without your car). 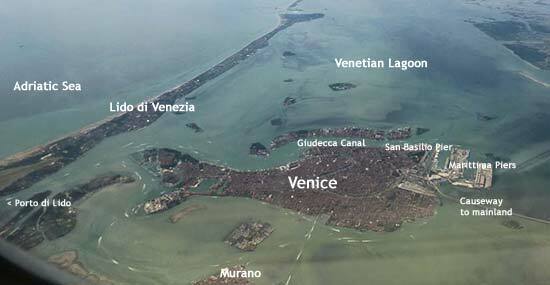 ABOVE: The Lido di Venezia is a barrier island between the Adriatic Sea and the Venetian Lagoon. From the Lido - Santa Maria Elisabetta ACTV stop (near the dot below "Lido di Venezia"), Venice's historic center is only a few minutes away by public water bus. The Lido di Venezia is only a short trip by vaporetto from Venice's main tourist haunts, but it has an altogether different vibe. The island (which protects the Venetian Lagoon from the Adriatic Sea) is a beach resort and dormitory suburb where you can drive, ride bicycles, work on your tan, or even play golf. As a bonus, hotels tend to be cheaper on the Lido than in Venice's historic center. Hotels near the Lido Santa Maria Elisabetta waterbus stop are within easy walking distance of ACTV public vaporetti (which run frequently to Venice's historic center) and Alilaguna airport boats (which run between Venice Marco Polo Airport and the city, with a stop at the Lido). Stay at one of these hotels if you're visiting for a day or two or have bulky luggage. Lido villa and resort hotels are a bit farther from the Lido S.M.E. stop, but often by only a few blocks. Pick one of these if you're looking for more of a resort experience. If your ship arrives or departs at the main Marittima cruise basin (used by larger ships), you can take Alilaguna's Blue Line airport boat between the Lido S.M.E. waterbus stop and Marittima for a reasonable fare. This is much cheaper than hiring a water taxi, and it makes the Lido a great place to stay before or after cruises with Costa, MSC, Norwegian, Royal Caribbean, Holland America, Princess, and other "large ship" lines that use the Marittima terminals. See our illustrated 11-page Lido di Venezia Guide.